There are mainly four yogas which are spiritual paths leading to Self-realization or God. Yoga means union with God. This is union of Individual self or jivatma with Universal Self or Paramatama, the God. There are mainly four Yogas viz. Karma Yoga, Bhakti Yoga , Jnana Yoga and Raja Yoga. Karma Yoga’s aim is to fix one’s mind on God by means of work. It consists of breath-control, concentration, meditation, and so on, done in a spirit of detachment. If a householder performs his/her duties in the world in a spirit of detachment, surrendering the results to God and with devotion to God in his heart, he too may be said to practise Karma Yoga. Further if a person performs worship, japa (repetition of divine name) and other forms of devotion, surrendering the result to God, he may be said to practise Karma Yoga. 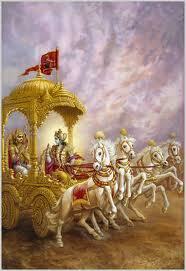 Attainment of God alone is the aim of Karma Yoga.